The 2018 sailing season is now nothing but memories and the stories we tell one another about the good times we've had on the water this past summer. Our boats are tucked away for the winter, and we won't think about them until early spring when they come out of hiding to be fitted for the new season. 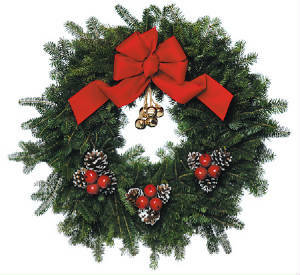 But in midst of this Holiday Season there is still time to think of sailing. 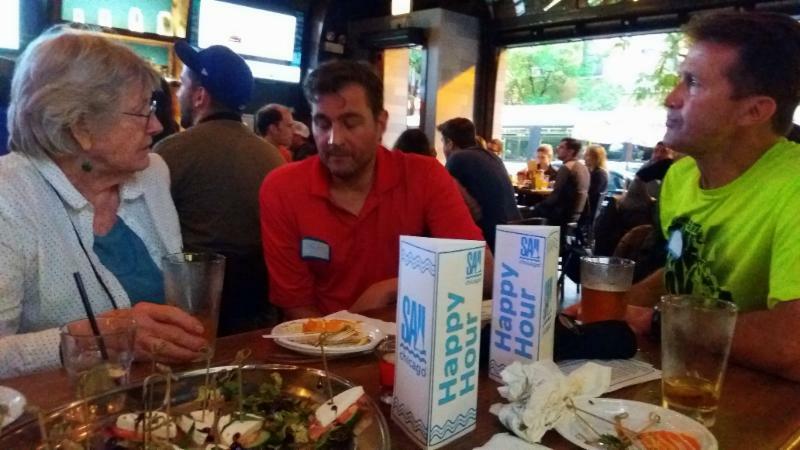 Some Sail Chicago members are planning sailing trips to the Caribbean in the coming months, where they can exercise their sailing skills in new venues. Others are looking forward to the Chicago Boat Show in January. 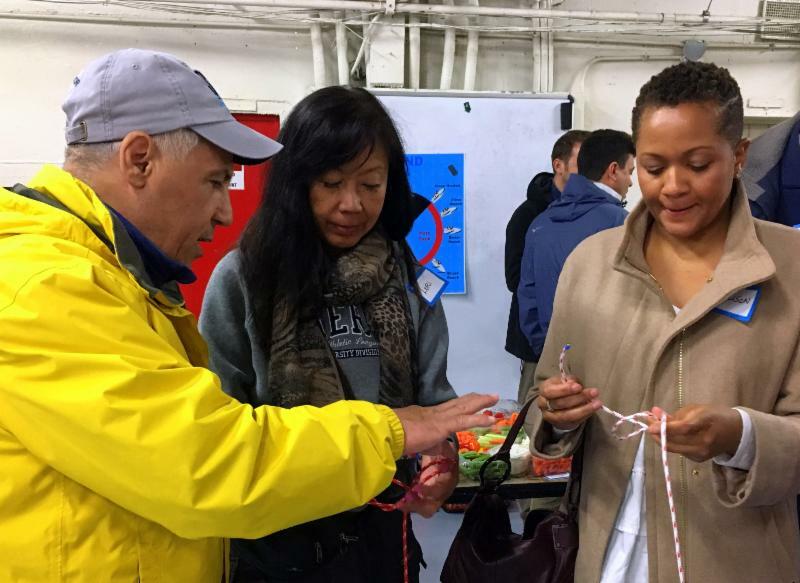 Here, in addition to seeing what's new afloat, they can attend seminars on all sorts of sailing-related matters and brush up on some practical skills they can put to good use next sailing season. They may also be able to pick up some new sailing gear at discounted prices from the vendors who will be there. Many of us will also volunteer at the Sail Chicago booth during the Show (see article below). Here we can share our love of sailing with people who may be attending the Show for the first time and are looking for ways to get out on the water. Whatever your winter plans, we hope that your experience of the upcoming Holidays is filled with joy and good cheer, and we look forward to seeing you again on the water in the New Year! Chicago is about to freeze over, and we are longing to be back on the water, but luckily the Midwest's premier boat show is coming to McCormick Place January 9-13 to help us get over the winter blues. The Chicago Boat, RV and Sail Show is a truly spectacular event. Hundreds of local and national exhibitors will fill the South Hall, giving sailors the chance to preview the latest in sailboats and equipment. 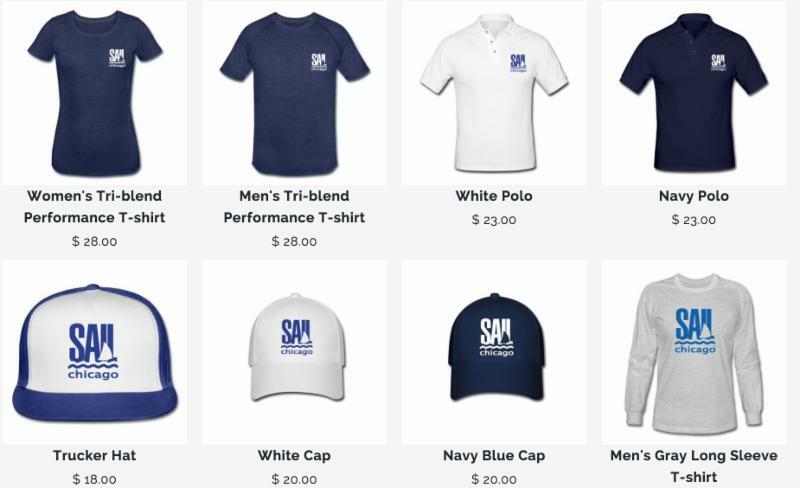 This is a great opportunity for Sail Chicago members and students to make connections in the sailing community, attend seminars, and pick up sailing gear for the upcoming season at a significant discount. 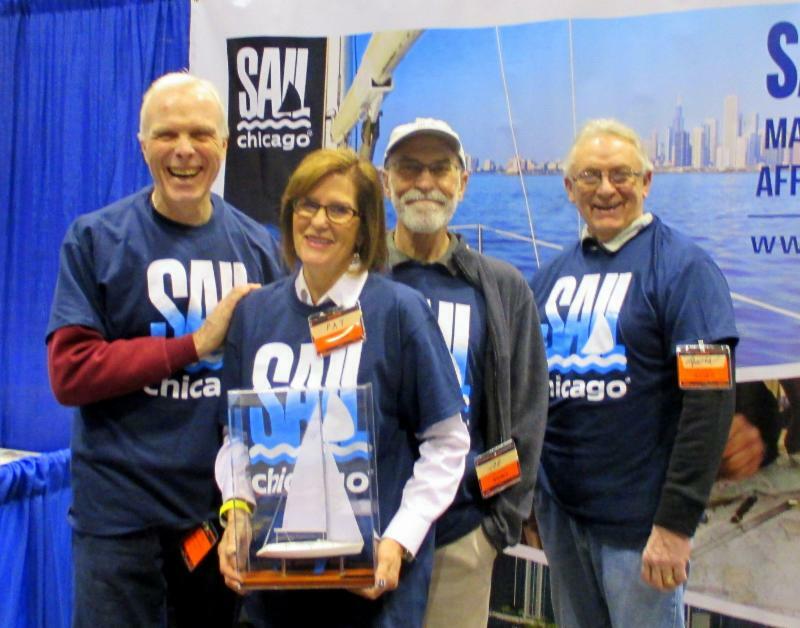 Sail Chicago has long been part of this event and we are fortunate to have been well-represented by volunteers at our exhibit over the years. Let's make this another great year! Volunteers get into the show for free and will have the chance to browse exhibits or tour the boats on display before, during or after their shifts. Your commitment will be just a few hours of sharing your enthusiasm for sailing with potential new members of Sail Chicago--a great deal! NEW THIS YEAR IS THE OPPORTUNITY TO FULFILL YOUR 2019 ANNUAL SERVICE REQUIREMENT BY VOLUNTEERING AT THE BOOTH FOR A TOTAL OF 20 HOURS THROUGHOUT THE SHOW. You may schedule your volunteer time over multiple days, and you will be given first preference regarding the hours that you volunteer. Other volunteers who are not fulfilling their service requirement will be scheduled on a first-come-first served basis. If you have questions or would like to sign up, please contact Mary Egan via email. Be sure to include "Chicago Boat Show" in the subject line, indicate your 1st and 2nd preferences for the day(s) and time(s) you want to volunteer, and your cell phone number. See you at the Show! 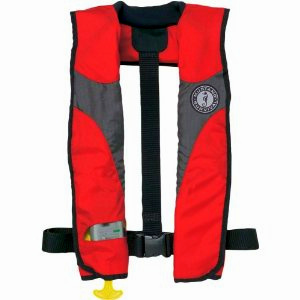 In light of the concerns about inflatable life jackets following the death of Mac racer Jon Santarelli last summer, Chicago Yacht Club is sponsoring a Life Jacket Clinic Saturday, December 9, from 2 pm to 4:30 pm, at CYC's Monroe Station (adjacent to the Monroe Tender Dock). I encourage all sailors to attend and to let your boating friends know as well. 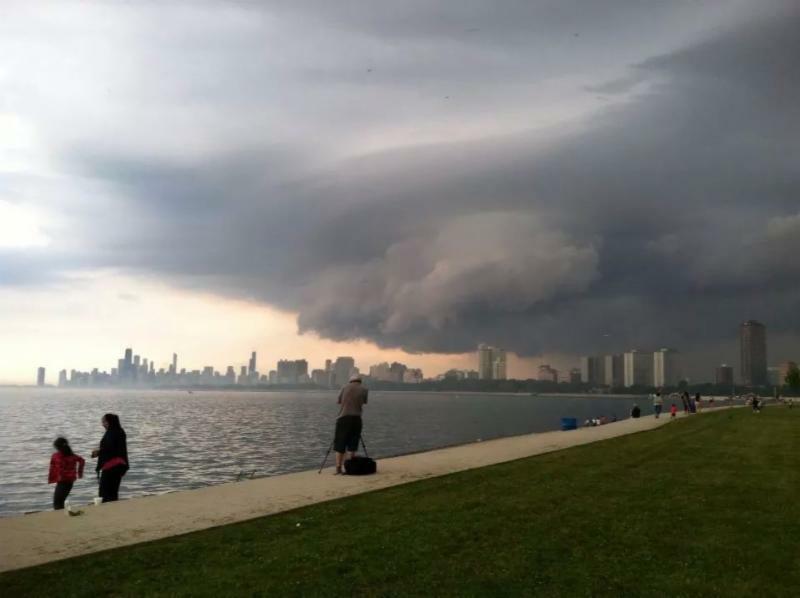 Chicago Yacht Club says, "Bring in your inflatable PFD. Learn how to repack it, how and when to maintain it, how to find out about product recalls and updates, and how to know when it's time to replace. Join industry experts from Crowley's, Spinlock, Mustang, Absolute Indoor, Onyx, and Crewsaver for hands on education. 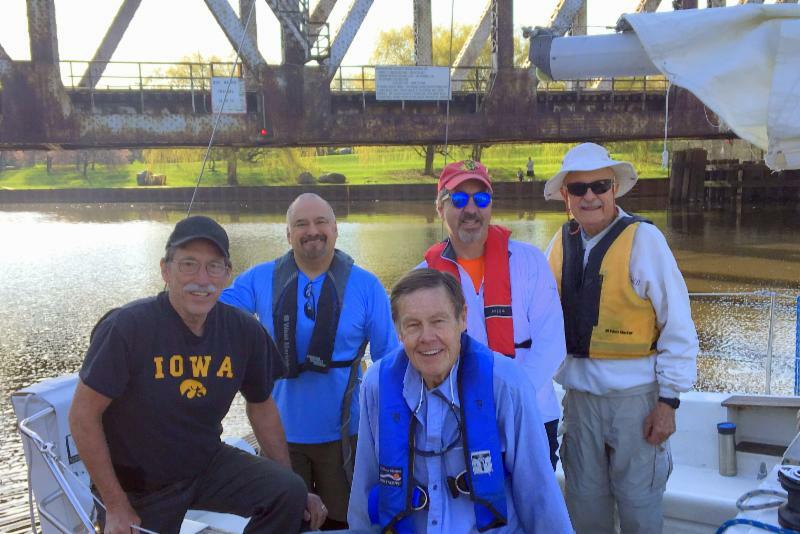 The clinic is free and open to all in the Chicago boating community, but advanced registration is required by calling the CYC Front Desk at 312-861-7777." In addition, there is an interesting discussion about inflatable PFDs posted recently in Sailing Scuttlebutt. You can read the article here. Last winter the whole Instruction Corp along with a smaller Safety Committee wrote the new SC Wind Guidelines. This winter a group of about 10 SC Instructors are involved in a Student Progress and Curriculum Committee. The group's aim is to streamline our students progress through to Skipper status, to build in some accountability within our system and to further standardize what and how our Instructors teach. Any member is welcome to offer suggestions or ideas to the committee to help support our work. Questions or comments? Please contact me. Good question. Monroe Harbor is now half empty during the sailing season. At least some of the answers can be found in a recent article in the Chicago Tribune that was forwarded to us by Sail Chicago member Ed Schroeder. To get the full story, click here. Flying a spinnaker can be fun, and it makes you look great. 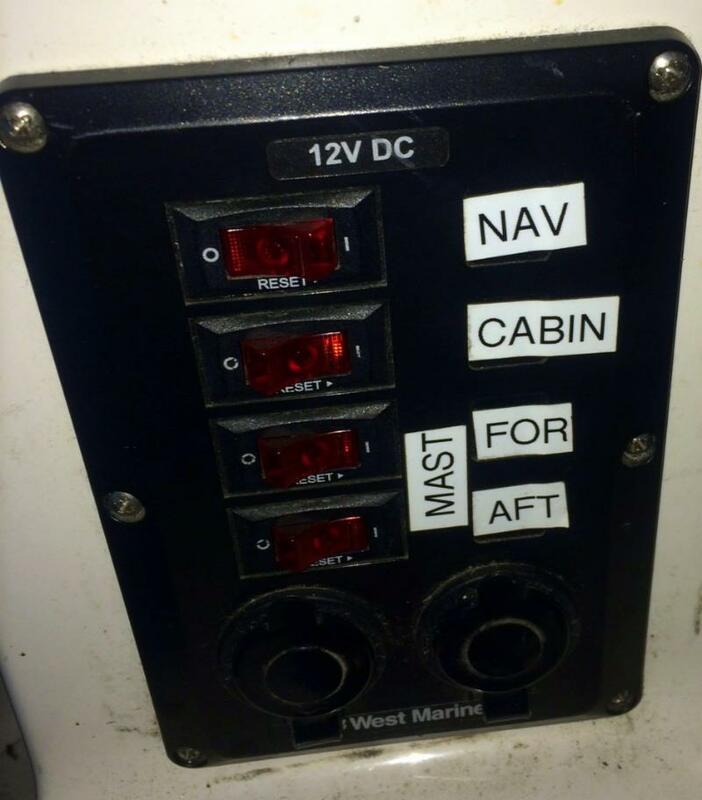 But you also need to be sure you know what you're doing and that you have some experienced crew on board when you do. Otherwise, you could really land yourself in trouble, like these sailors did. To watch the whole debacle, click here, and let it be a good lesson for us all. Summer is here at last, and after an extended period of unpredictable weather the long-term forecast seems to be warm and sunny. We hope you've already had a chance to get out on the water, even with the past unpredictable weather patterns. 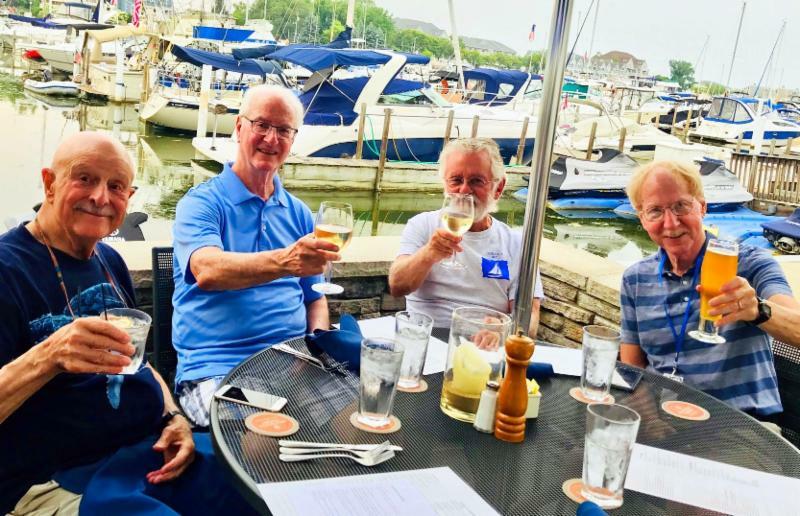 Now that things seem to be improving, there's really no excuse not to be enjoying sailing on Lake Michigan in our fleet of Colgates, Rhodes, Ideals, and our cruising boats Calypso and Priorities. 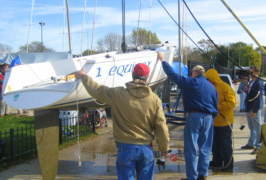 If you're a Sail Chicago certified skipper, you can schedule a boat for private use when it's not being used for other program functions. If you're not a skipper yet, schedule a Tiller Time if you've taken an instruction class in the past year, or sign up for a Member Cruise Outing. Both are free for members. And if you feel more energetic, you can always sign up for our Colgate Racing program, where you can quickly hone your sailing skills. Boating safety is always a concern here at Sail Chicago. Our Rules and Regulations state that no alcohol is allowed on any boat in our fleet, and that everyone on board a boat in our fleet must wear a life jacket. Also, there is no swimming off any of our boats. For a more comprehensive list of do's and don'ts while on the water, click here. SAVE THE DATE! August 11 at Columbia Yacht Club. Watch for more information to follow. 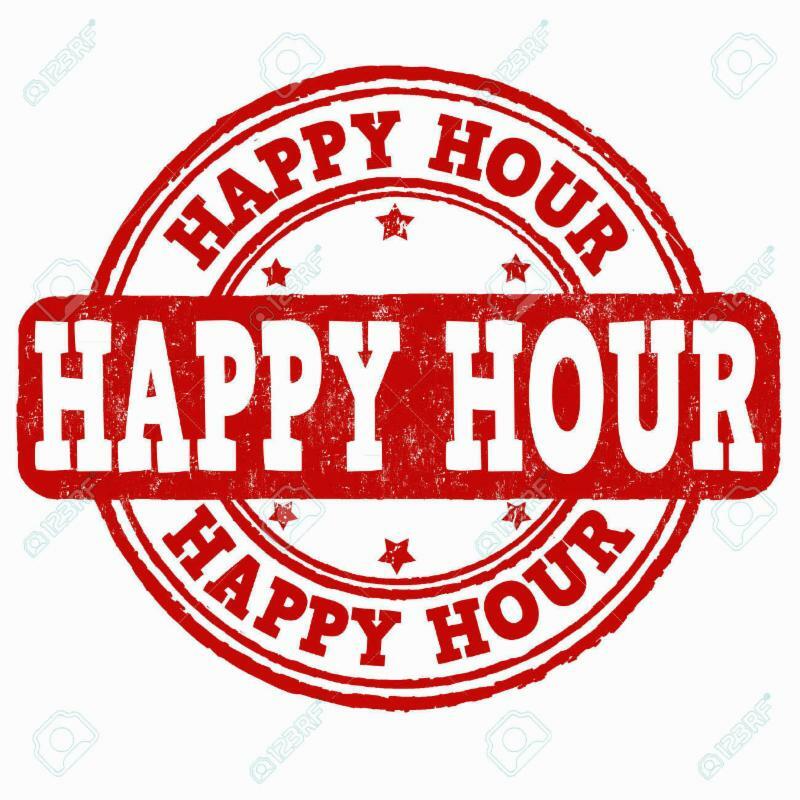 Our next Happy Hour will be Thursday, July 19 at Interurban Boathouse located at 1438 W. Cortland on the Chicago River beginning at 6 p.m.! There is ample free lot parking and is a short walk from the Clybourn Metra station. Please join us and your fellow sailors as again we will have appetizers and a free drink for the first 10 arriving sailors! We had a good turnout at our first happy hour of the season! Sail Chicago members and students came together to share delicious apps (quesadillas, veggies, and wings) and of course, libations. Sailors had a chance to get to know each other and show off their trivia knowledge! 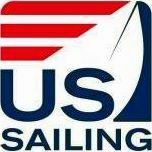 The US Sailing Basic Keelboat Certification exam will be given during the pre-sail orientations at Columbia Yacht Club on the following date: 7/31/18 at 7:00 p.m.
We are starting to solicit donations for our second annual silent auction fundraiser, which will take place at our end-of-season dinner! We are looking for gift cards, event tickets, etc. If you have a connection with a company who may be willing to donate goods or services, please contact Rachel Granneman. We are not looking for donations of used items. Do you wish you understood how to use the GPS system on Calypso? Then come to this hands-on chart plotter learning session conducted by Jeremy Shaw. You will learn how to create waypoints and routes, record the track you've sailed, estimate the time to port, mark crew-overboard positions, view AIS and DSC position reports, create routes and waypoints on your computer and more. After a 45 minute walk through, we will leave the harbor and go for a sail (weather permitting) with each person taking turns plotting a route, and then following it at the helm. We will also cover basic DSC (Digital Selective Calling) usage on the VHF radios. DSC is used for more than just the distress button. I've updated the charts and electronics and am looking forward to introducing you to this vital skill for cruisers. The session will be held for all Calypso skippers (no guests please) at Burnham harbor. Contact Jeremy Shaw if you wish to attend. The date for this class will be determined based on the availability of interested parties. If you're a cruising boat skipper or crew, or you'd like more information about our cruising program, please click here to view the latest Cruising Notes. It contains some valuable information about orientations on Calypso, rusty skipper sails on Priorities, and hard lessons learned on a recent cruising expedition. Trouble starting an outboard engine? If multiple pulls on the starter cord do not generate even a hint of ignition, try disengaging the kill switch tab, then re-inserting it. Sometimes the switch settles in the off position, so the engine will not start no matter how many adjustments are made with the throttle and choke. Other troubles with the engines? With the new mooring configuration and wind guidelines, we have an increased reliance on the outboard engines. Therefore, it is important to identify any engine that does not have a high level of dependability and, if necessary, replace it. Please report any problems to maintenance@sailchicago.org (even minor problems that you are able to overcome - except the kill switch issue). A new member of the fleet. You may have noticed the rigid inflatable boat (RIB) rafted to Equinox on X10. This RIB is used to facilitate maintenance on the Colgates, Rhodes and Ideals in Monroe Harbor. For those wishing to sail Equinox, separating the RIB is a simple matter of releasing some spring clips. To see how, click here. Excess inventory sales: Sorting and selling our excess inventory in re-usable condition, via Ebay, Craigslist, etc. Aside from picking up inventory, this can be a remote position. Email monitoring: We are currently lacking in this area and need additional help. Remote. Instruction Registrar: Liaises with students who have scheduling conflicts, arranges class transfers, student cancellations, assists with PSO organization and online instruction manual codes, and answers general instruction questions. Remote; all work is handled on the computer or over the phone. Scheduler: Liaises with instructors who have scheduling conflicts, enters class/boat reservation modifications or additions, and helps with the initial construction and input of the instruction schedule. Remote; all work is handled on the computer or over the phone. These positions meet service requirements. Even if you've met your requirement for the current year, one of these positions may be more appealing than the area where you're currently volunteering. They will qualify you for service time next year. If you'd like more information, please contact me. 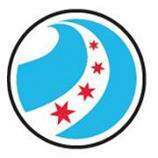 Providing sailing opportunities to the Chicago community is the mission of Sail Chicago. To further this goal, we are celebrating the fifth season of Sail Chicago's association with the Schuler Foundation. In its twentieth year, this foundation tutors, councils and educates under-privileged Chicago-area students through high school and college. They have an incredible success rate of 94%. 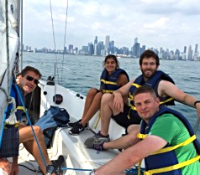 Sail Chicago provides these deserving students with a fun sailing experience. On June 6, the Schuler Foundation hosted a luncheon at the Columbia Yacht Club for the the Sail Chicago volunteers. Eleven of the our sixteen volunteers enjoyed lunch and listened to a presentation by Margaret Falter, Volunteer Manager of the Schuler Foundation. We learned more about the foundation and the population it serves. Additionally, we discussed safety practices and procedures for our Wednesday afternoon sail. If you are interested in volunteering for the Schuler sailing program, please contact me. 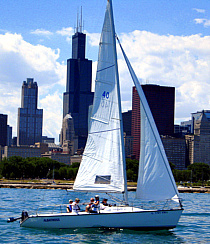 Sail Chicago also provides sailing opportunities to under-privileged children through Lawrence Hall Social Services and the Association House of Chicago. 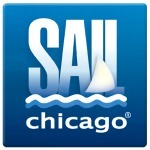 Learn more about all three programs on the Sail Chicago website. It's not uncommon for the Coast Guard to request to come aboard to conduct a routine safety inspection. On the evening of July 10th, as our MCO was just getting underway, we were leaving Burnham Harbor when the Coast Guard vessel hailed us and asked us to dock nearby. The team still had fenders out, but was stowing docking lines. They quickly pulled the lines back out and we docked Calypso neatly. The Coast Guard team greeted us and explained they have a goal of boarding every boat in the Chicago Marinas. First thing they want, of course, is the boat's license and registration. I frantically searched the boat for paperwork and found it in a large envelope marked "license and registration" in the navigation table. Next, they ask about your safety equipment: fire extinguishers, horn, flares, etc. Finally, they complete the paperwork and provide us with a copy. If we are boarded again, show your paperwork and they'll move on to the next boat - it's in the envelope in the nav table. Got any photos of our boats or on the water activities? I'd love to see them. We're putting together a marketing piece for next year's Strictly Sail Show at McCormick Place, and we need some great photos to show the world what Sail Chicago does. Please email me your photos or tell me how I may retrieve them. Many thanks! 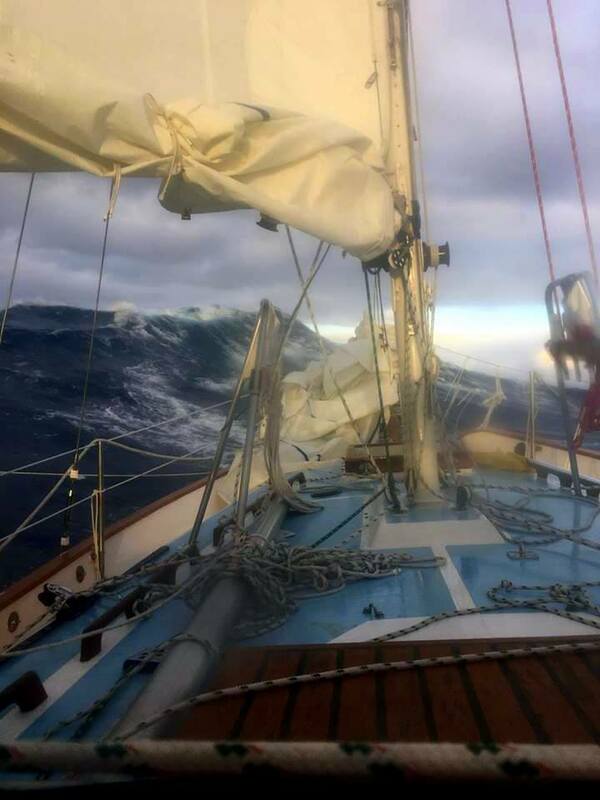 Bob Lapin recently sent us this article from Practical Sailor Magazine dealing with how to manage sailing in gusty winds. 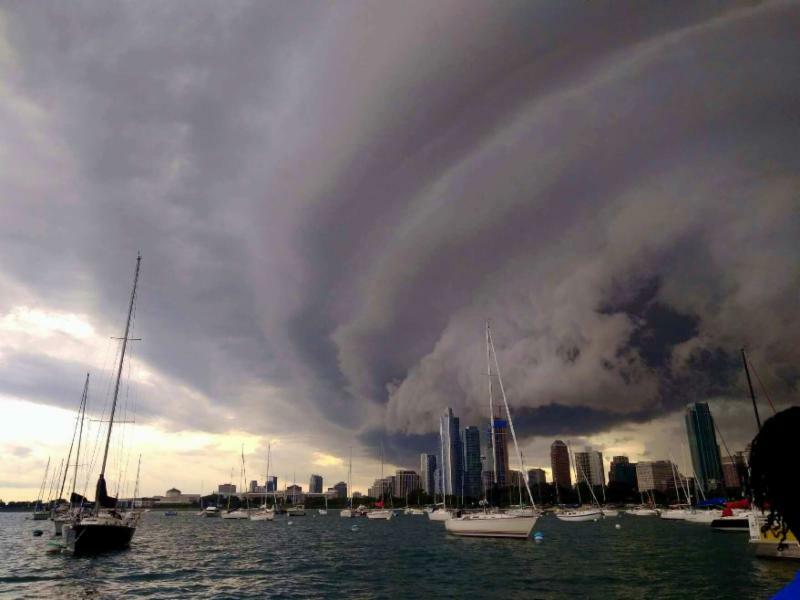 It's also a good read on the benefits Lake Michigan has for Chicago sailors. Thanks, Bob. 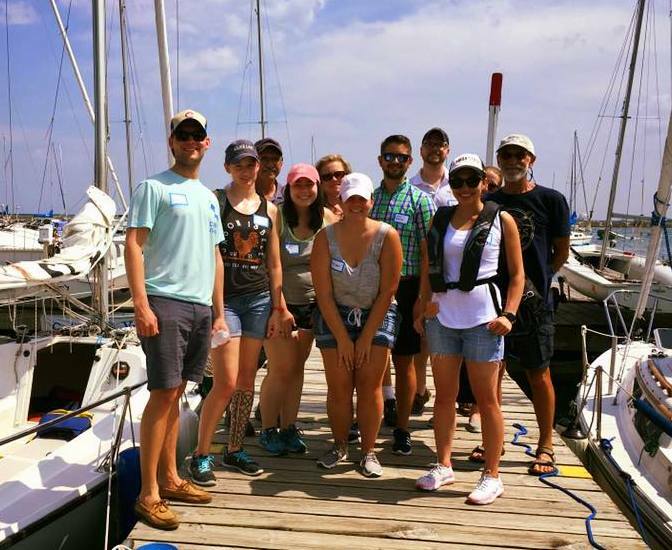 If you want crew or want to crew, our Share-a-Sail Program is just what you need. On your computer, go to Google Groups and search for Share-a-Sail. Register your name, first and last, and your email address. Then you'll be able send and receive emails to and from other participants who are eager to sail with you. Replies go only to the sender so you will not be plagued with responses to other senders. There is no "reply to all." To post an email in email in Share-a-Sail specify the date and time you plan to sail and your name. It's that easy! Questions? Contact me. Last season, I returned to Sail Chicago (where I originally learned to sail) after 13 years of teaching Sea Scouts on large boats. 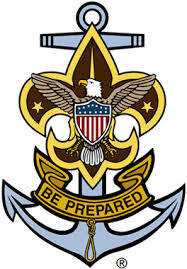 I am writing this article is because the Sea Scout program is looking for skippers who would like to volunteer as adult advisors on our keelboat - the "Edward B. Stein" (it's a red colored C&C 34, moored at N-2 in Monroe harbor). We sail it every Monday evening and most weekends. 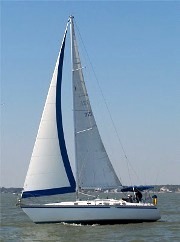 In addition, many of you have children and grandchildren who you might love to expose to sailing. For the kids, it is an awesome experience to be part of a crew that actually sails the boat. For 9 years my skipper raced in the MAC and I would drive up to Mackinac Island with 6 Sea Scouts. We would then spend the next 5 days sailing, port to port, back to Chicago. 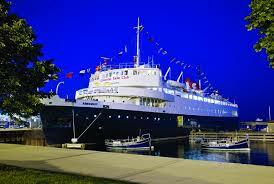 Each day, after sailing, we would duck into a harbor on the east side of Lake Michigan for a good meal and to sleep. We welcome anyone who is qualified to become a skipper on a large keel boat and any girls or boys between the ages of 11 and 20. There are often more girls than boys, but all are welcome aboard (with their parents or guardians) to sail with us and determine if they are interested in the experience. If interested please contact me by email or phone me at 312-671-2049. The Chicago Maritime Museum opened in a new venue adjacent to the Bridgeport Art Center in 2016. 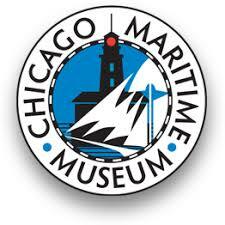 It's a treasure trove of Chicago and Great Lakes maritime history. Some afternoon when you've had to cancel a boat reservation because of foul weather, you may want to spend some time exploring this fascinating museum. Here's a brief video showing you what to expect. Rounding Cape Horn in "The Mighty Sparrow"
A friend of mine, Jerome Rand, has just completed a solo circumnavigation of the Globe in "The Mighty Sparrow," his Westsail 32. 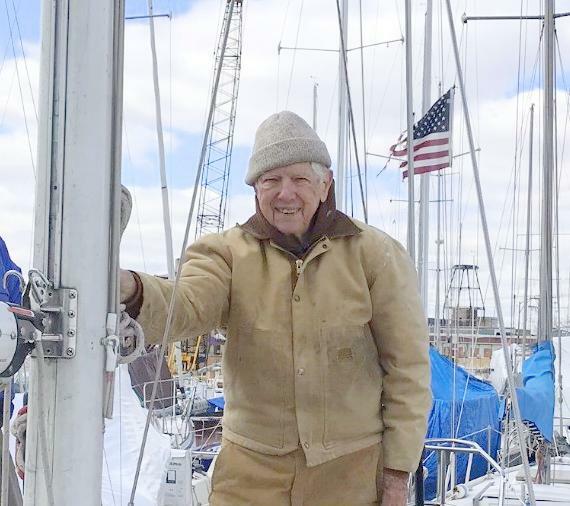 On Sunday, July 1, he sailed into Gloucester, MA Harbor after 271 consecutive days at sea. I've been following him on his daily posts in Facebook, "Sailing into Oblivion." He faced innumerable challenges, not the least of which were taking what seemed like weeks in bad weather and high seas to get around Cape Horn at the tip of South America, and running out of food near the Falkland Islands. If any members of Sail Chicago have a trip like this in mind, I'd be happy to put you in touch with him. Here he is on a practice run in 2017. The Board has purchased a motorized RIB (rigid inflated boat) to assist maintenance. The RIB is moored on the Equinox mooring ball. Procedures to get on and off the mooring ball will be communicated to all Ideal skippers. Columbia Yacht Club will continue to refuel our boats and the RIB will be used to top off tanks when missed by Columbia Yacht Club and complete other maintenance activities. Matt Stuczynski requested that wording be added to our website informing all students that four classes are not guaranteed. Instructors will make every effort to get out on the water or reschedule classes, but during a spell of bad weather, it may not be possible to get out on the water or conduct all four classes. The next meeting was held at 7 PM on July 12 and was conducted by tele-conference. Member Cruise Outings - MCOs are offered free to members and provide an opportunity to get out on the water with an experienced skipper. 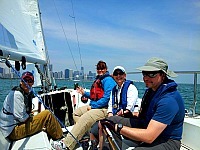 Members who want to experience a casual sail or learn about a boat they haven't sailed before can sign up on the Reservations page of the my.sailchicago.org website. Tiller Times - This program is designed for member students to practice the skills they learn in their formal classes under the guidance of an experienced skipper. We believe that the best way to become a competent sailor is to gain lots of experience, and this is a good way to do it. 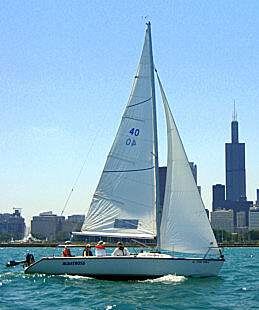 Member students may sign up on the Reservations page of the my.sailchicago.org website. Service Sails - Sail Chicago has partnered with youth organizations and social service agencies such as Lawrence Hall Youth Services and the Schuler Scholars program to provide opportunities for youth to get out on the water and experience the fun of sailing. Contact info@sailchicago.org or watch future issues of Between the Sheets for more information. Sail Chicago member David Kelpsas has written a "Letter to the Editor" commenting on my last month's editorial column. To read it, click here. SAILING SEASON WAS KICKED OFF WITH A PARTY! Stuczynski (head of instruction) and Jason Wirth. Nick Brait walked away with the grand prize after successfully tying knots behind his back. 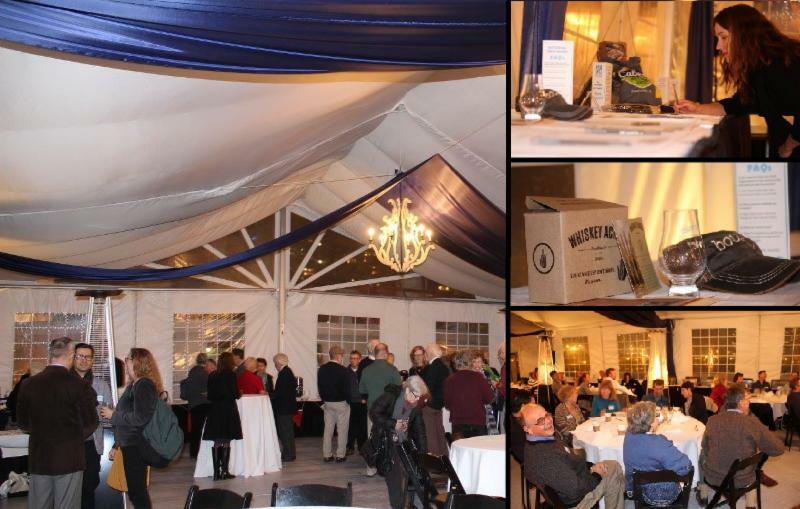 We also had a small fundraiser by raffle, and prizes such as dry bags and Sail Chicago swag were awarded. The raffle raised around $200 that will go toward fleet renewal. Thanks to Kelsey Simoens for organizing food and drinks, Rachel Granneman for organizing the raffle, and all who brought coolers and helped us set up. Last but certainly not least, thanks to Maureen Huston, Joe Cannon, and the crew who brought down Calypso in what were true Chicago weather conditions! The first Happy Hour of this sailing season will kick off at 6:00 p.m. at the Flagship Tavern in Lakeview. Come join in the fun, munch on appetizers, meet other sailors, and swap sailing stories. The first ten people to show up will get a free drink ticket. Many volunteer positions have been filled at this point, but we do still have a few more roles to assign. As a reminder, first-year members are not expected to complete service time but are welcome and encouraged to do so. As part of our mooring fee, one parking pass is allowed for each boat at Monroe Harbor. These passes are only available for skippers and instructors who will be sailing a boat during the period the pass is being used. The pass must be signed out in the booklet and returned one-half hour before the start of the next period so that the next skipper can use the pass. Each pass is labeled with the name of the boat where it is assigned. If the pass for your boat is missing, do not use the pass from another boat. If you lose a pass or find one missing, please report it immediately to me so that it can be replaced. If you park your car in the Monroe Drive circle while getting a pass, leave your flashers on and put a note on your windshield. While we don't guarantee it, doing so may prevent your car from being ticketed. This program is dependent upon the cooperation of all skippers and instructors. Please do your part. 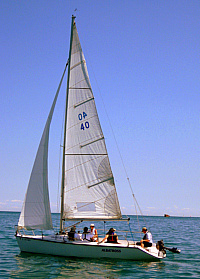 A basic sailing class reviews sailing principles while waiting for the Monroe tender. 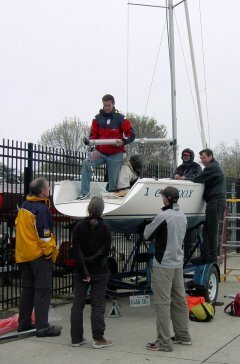 text/course in order to gain Sail Chicago skipper status. The new online version of the text includes quizzes after each chapter and a final test; all quizzes must be passed with an 80% minimum before continuing on to the next section. One can also start and stop at her/his own convenience and logon access never expires. 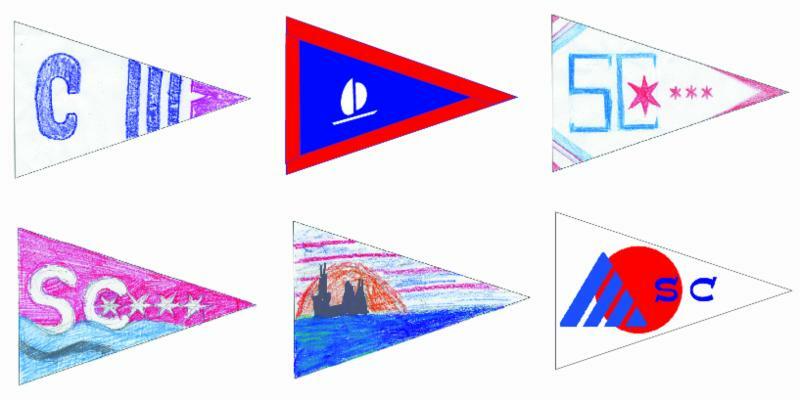 The best thing about the online text is that it features animations so students can more easily envision the wind blowing and sails being trimmed in and out. Anyone is welcome to buy the book online for $50 while we are offering it to our students as part of their course fee. You can check it out here. 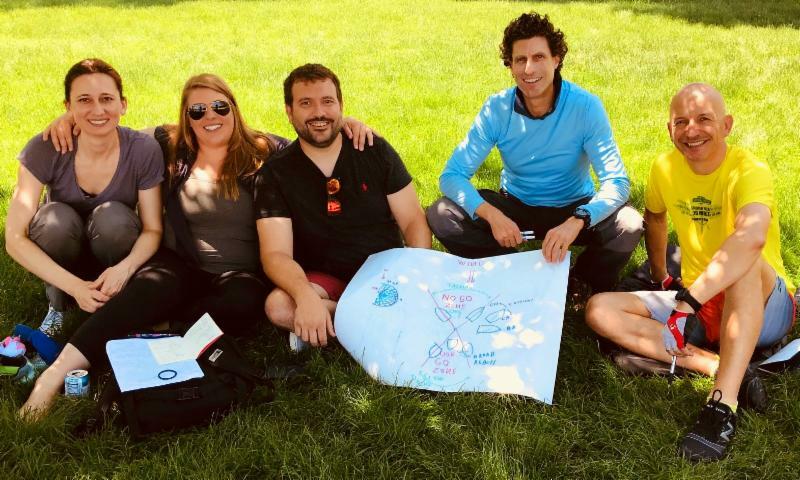 To raise the skills of our instructors and continue to align our instruction program with US Sailing certification process, Sail Chicago has chosen to adopt a goal of having all of our instructors pass the BKI evaluation in the next three years. Sail Chicago will provide financial support, as well as provide a get-ready for certification training program for our instructors. evaluation of our instructors' ability to teach sailing to the US Sailing Keelboat Certification System Standard. This standard is the most rigorous in the country and requires practice, study, and preparation by even the most gifted and experienced professional instructors. There is little formal training, education, or time for practice during the BKI evaluation. Two students attended the recent BKI evaluation in early May hosted by Columbia Yacht Club. Prior to the BKI Evaluation, we ran a land class with practice exams and an On the Water session to practice single handling COB drills. We are planning to schedule our own BKI Evaluation at the end of the season, but will need a minimum of six participants for US Sailing to send out an instructor trainer to run the class. If you are an instructor and are interested in participating in the BKI Evaluation at the end of the season, send a quick email to me. The US Sailing Basic Keelboat Certification exam will be given during the pre-sail orientations at Columbia Yacht Club on the following dates: 6/9/18 at 9:00 a.m., 7/14/18 at 9:00 a.m., and 7/31/18 at 7:00 p.m.
WATCH FOR DERECHOS WHEN SAILING! 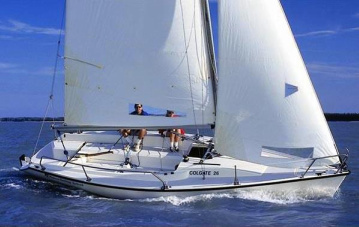 Five-sail packages for our cruising boats are again available at the same prices as last year. See the May issue of Between the Sheets for the links to register. Do you wish you understood how to use the GPS system on Calypso? Then come to this hands-on learning session conducted by Jeremy Shaw. You will learn to create waypoints and routes, record the track you've sailed, estimate the time to port, and how to mark crew-overboard positions. After a brief walk-through, we will leave the harbor and go for a sail with each person taking turns plotting a route, and then following it at the helm. Jeremy has updated the charts and electronics and is looking forward to introducing you to this vital skill for cruisers. The session will be held for all Calypso skippers (no guests please) at Burnham harbor on May 28 and June 4 from 1800 to 2200. There is room for four skippers at each session. Contact Jeremy Shaw if you wish to attend. Eight people are already on the waitlist and are being scheduled. 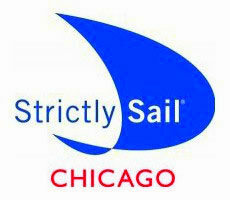 The "Procedure Manuals for Priorities and Calypso" can now be found on the Sail Chicago website. Go to membership/files/cruising documents. 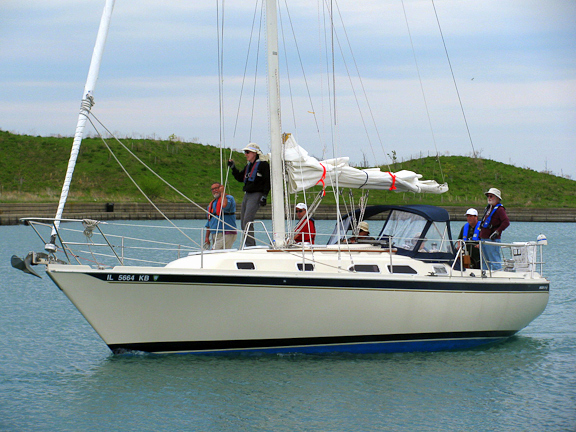 Sail Chicago now has a membership to the Great Lakes Cruising Club for the 2018 season. Their many members update a website with all the latest information on harbors and harbor towns on the Great lakes. Please contact Bob Lapin if you would like specific information. Priorites crew poses for a river photo. to her summer berth was fun, but not without its problems. It was a beautiful day for a sail, one of the few in May, with none of the usual freezing rain, high winds, or tsunamis. Joe Sjostrom brought along donuts and coffee, which endeared him to the rest of the crew. The second drawbridge on the route opened about half way, but then lost power. Luckily the crew was able to maneuver the boat to the far side of the bridge, where the mast just barely squeaked under it. Priorities is now tucked away in its slip, right next to a huge powerboat. Skippers will have to be very careful when maneuvering the boat in and out of slip. Fortunately, Priorities carries plenty of bumpers. teams have quite a bit of work to do and are frequently very busy. 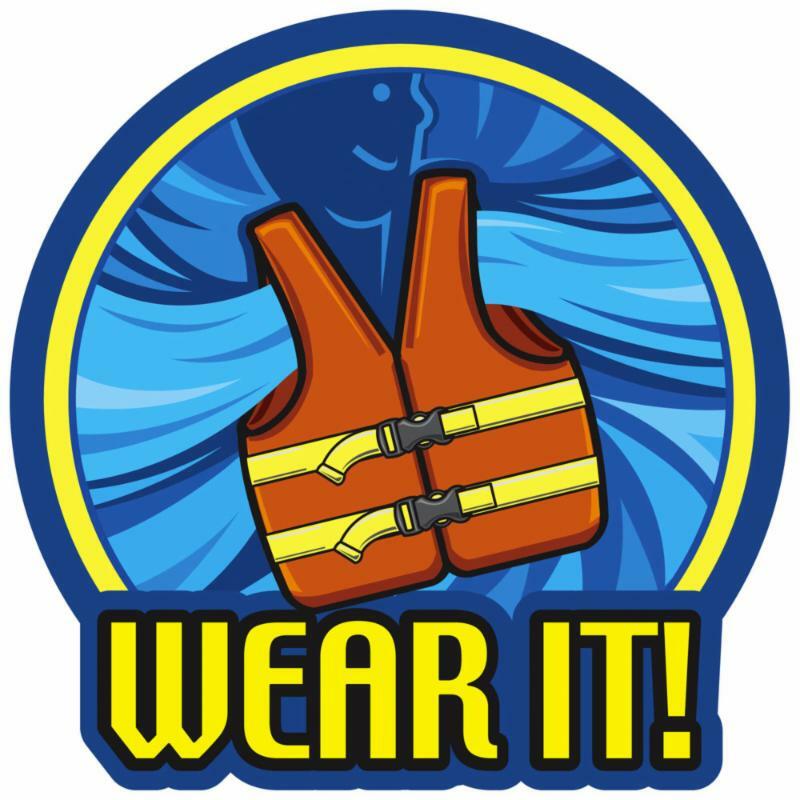 Anything that affects boat safety, especially rigging, motor, and safety equipment. Very low gas (but we have had a lot of false reports here. The new tanks have a rated capacity of 3 gallons, but do not look full when containing this volume). We will develop a reliable gauge/dipstick ASAP to deal with this issue. If there is a serious issue that you feel could put another user at risk, TAKE THE BOAT OUT OF SERVICE AND NOTIFY THE NEXT SKIPPERS who may not check the web site in time. Found items from previous trips: try contacting earlier skippers directly. Cleanliness issues can be reported on the checkout sheet. The maintenance team reads these reports weekly. Duplicates of existing issues. It doesn't really help to add them again. Missing items that do not affect the safety or functionality of the boat. Email the boat manager directly. Orange: Repairs needed, but seaworthy. Red: Unsafe, take out of service. Red is self-explanatory. Next month examples of yellow and orange alerts will be presented. Teams to refuel the Colgates and Rhodes on a weekly basis (or more often, if needed). A detailing team to remove deck stains and oxidation, then seal the surface with an appropriate non-slip deck wax. A fiber-glassing team to repair superficial chips, crazing, and previous less-than-elegant patchwork on the decks, cockpits, and in the cabins. With implementation of the new wind guidelines, a checklist that incorporates consideration of weather conditions into pre-sail preparations has been developed and will be on board within the week. A new checklist for weekly use by the maintenance teams is also in development, which will include more detailed inspection of the outboards than current practice. In addition, the detailed instructions for outboard engine operation, described in previous issues of BTS, will soon be affixed to the inner side of the fuel hatch covers on the Colgates and tethered under the stern decks of the Rhodes. Skipper Alert: While on the subject of the outboards, there have been numerous reports of the engines "failing" to lock into a straight-ahead position. However, the steering adjustment screw at the back of the shaft was never meant to lock the engine into a straight-ahead orientation. Page 9 of the Tohatsu manual explicitly states: "The steering adjustment screw is used to adjust the friction load of the steering, but not to fix the steering. Excess tightening of the adjustment screw may cause damage to the swivel bracket." Furthermore, the engine is not locked in a vertical position when the gear shift is in forward. The engine needs to be able to "kick up" if a floating or submerged object is hit by the shaft while the boat is moving forward. Otherwise, severe damage to the engine and/or transom of the boat will occur. The Sail Chicago Board met at the Morningstar building on May 10. Boats are in the water. Classes and rentals are up and running. The hard work of everyone is appreciated as we begin the sailing season. The Board authorized an expenditure of up to $2,100 for the acquisition of a motorized rigid inflated boat. Joe Cannon will look at options and report back next month. It is expected that instructors receiving the reimbursement will teach at least four classes. The next meeting will be held at 7:00 p.m. on June 14 at the Morningstar building.